This is just a beginning: Gezi resistance and the legitimacy crisis of the AKP government! Last summer, Turkey has witnessed an unprecedented social mobilisation, maybe the most significant and intensive one in the post-1980 military coup period. 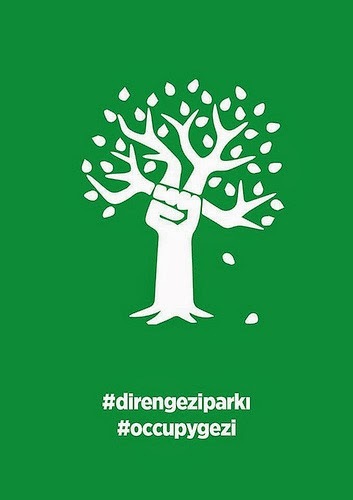 Between the 28 and 30 of May, a group of environmentalists, who were camped in the Gezi Park to prevent the destruction of the park for the re-construction of the 18thcentury Ottoman Taksim Barracks, were violently evicted by the police. While the activists were beaten and tear gassed, their tents and equipment were burned by the officials. This sparked a massive outrage and paved the way to the subsequent demonstrations and clashes with the police forces that lasted for almost four months. In this guest post, Ertan Erol assesses the wider implications of this moment of social mobilisation in Turkey. The reaction of the members of the governing Justice and Development Party (AKP) remained undecided and more or less surprised until the Prime Minister Recep Tayyip Erdogan concretised his hard-line position accusing the protestors of being looters and part of a foreign conspiracy that aims to increase interest rates and, thus, damage the Turkish economy. While the PM gradually elevated his criticisms on the protests and launched series of pro-government rallies called ‘Respect to People’s Will’ in the major cities of Turkey, the pro-government media launched a campaign of slander making various claims about the protesters, allegedly showing their links with foreign agents and their fanatically anti-religious and anti-Islamic orientations. In the international arena the AKP officials also continuously claimed that the police reaction was moderate, at least not heavier or different than the use of police force in the Western world. PM Erdogan himself gave the example of the police intervention during the Occupy Wall Street events in New York claiming that 17 people had been killed, which was immediately refuted by the US Embassy in Ankara. Nevertheless, the AKP’s arguments trying to justify the use of police force during the Gezi Resistance have no credibility. A recent report published by Amnesty International (October 2013) noted that the right of peaceful assembly that is protected by various international conventions and by the 34th article of Turkey’s constitution was arbitrarily denied in many parts of the country due to the abusive use of force by the police (quoting the Turkish Medical Association): 8000 people were injured of which 61 severely, 11 lost an eye, 104 suffered head injuries and 3 people died as the direct result of the brutal use of force (2013: 15). In the same report it was also stated that the police force abused the use of less lethal weapons such as tear gas and water cannons. According to government sources only in the first 20 days of the protests 130.000 gas canisters had been used, while 60 water cannons, which in some cases carried water mixed with chemical irritants that might cause first degree burns on human skin, were arbitrarily implemented against the protestors and bystanders (2013 18, 19). The report also noted unofficial detentions, sexual assaults, beatings by the police force, and the arbitrary prosecutions and raids aimed at organisers of the protests, lawyers, journalists, medical personnel and social media users. The Gezi Protests and the violent, repressive and illegal response by the government and its law enforcement forces was immediately interpreted as an authoritarian turn in the AKP’s 11 years of rule. However, I argue that the protests and the government’s strong response needs to be located and identified within a wider process of neoliberal re-territorialisation of Turkey in the last three decades. Only by doing that, is it possible to identify these protests in the context of legitimacy crises that neoliberal hegemony is also facing simultaneously in other parts of the world such as Mexico, Chile, Brazil and Colombia. 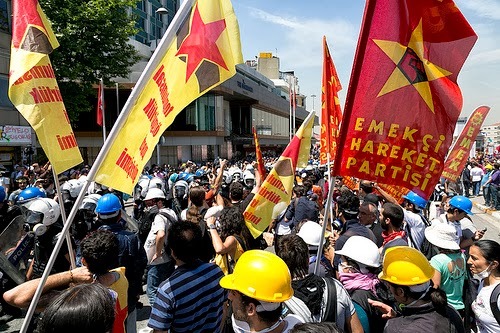 In that sense, it is indispensible to look back to 2010 and pin down the TEKEL workers’ resistance as a turning point, which should be seen as the beginning of the political legitimacy crisis of the AKP rule. In 2010 when the state tobacco company TEKEL was privatised and the TEKEL workers were forced to choose between resignation and accepting to sign yearly contracts, which were not guaranteed to be renewed, the TEKEL workers launched a fierce campaign of resistance and camped in a public park in Ankara. Since the 1980 military coup, it had been the first time a working class movement was able to mobilise and maintain a significant amount of people. 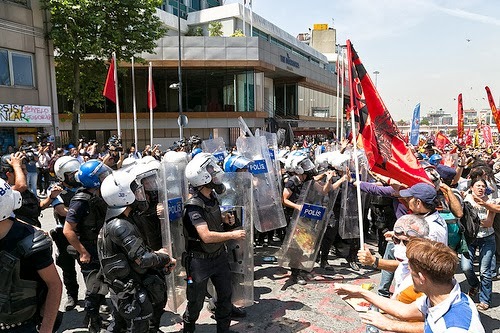 It is possible to argue that the reason why the AKP government used brutal police force to disperse the workers and protesters was the vitality of the case as the most obvious crack in the neoliberal hegemonic coalition that the AKP was representing. Thus, the TEKEL resistance became a turning point both for the government and the social movements either in the urban areas concerning public spaces or in the rural areas against the construction of micro dam projects. Since the TEKEL resistance it has become practically impossible to make a public demonstration criticising government policies without receiving strong police intervention with tear gas, detention and arbitrary legal prosecution. In 2013, starting from a protest in Taksim against the destruction of an old cinema building to the clashes following the prohibition of the May Day celebrations in Taksim square, the erosion of the political legitimacy of the AKP government increased the repressive response of these peaceful protests. This situation paved the way to the social explosion on 31st May which led to the four months of anti-government protests and different forms of political disobedience, which are now all summed up under the name of Gezi resistance. The impact of neoliberal re-territorialisation of public space in Istanbul coincided with the wider aspects of the crisis of neoliberal hegemony, which led to the explosion of social struggles and opened up significant space of self-determination and counter-hegemonic socio-spatial practices. Hoping to tackle this problem of legitimacy, the AKP government recently presented a series of liberalising reforms, a ‘democratisation package’, offering changes such as lifting the ban on the use of headscarf by public servants, or the general use of Kurdish letters Q, X and W and the original names of Kurdish towns, as well as returning the land previously belonging to an Assyrian Monastery in the southeast of Turkey. However, the package can hardly be perceived as a serious attempt of democratisation, since it is far from satisfying even the basic demands of the minority groups in Turkey or responding to the calls of the general public such as for the elimination of the 10 percent national threshold in general elections. In this context, one of the most common slogans of the protests becomes more meaningful: ‘This is just a beginning, the struggle will continue’. There is a direct link between the TEKEL resistance, the resistance in the Anatolian mountains and the Gezi Park protests, and additionally between the recent social struggles in Chile, Mexico, Brazil and Colombia. All are responses to processes of neoliberal re-territorialisation of social space on the periphery of global capitalism. Therefore, it should be expected that we will witness a continuous proliferation of social mobilisations and resistances in these countries, as neoliberal restructuring intensifies and extends the contradictions of neoliberal hegemony across different social scales. Ertan Erol has finished his PhD on the regional integration and development projects of Mexico and Turkey at the University of Nottingham in 2013. He is now working in the Department of International Relations at the University of Istanbul as an assistant researcher.